but we'll get it back, by hook or by crook! How did you find America? John: We went to Greenland and made a left turn. Would you like to walk down the street without being recognized? John: We used to do this with no money in our pockets. There's no point in it. Are you scared when crowds scream at you? John: More so in Dallas than in other places perhaps. Is it true you can't sing? 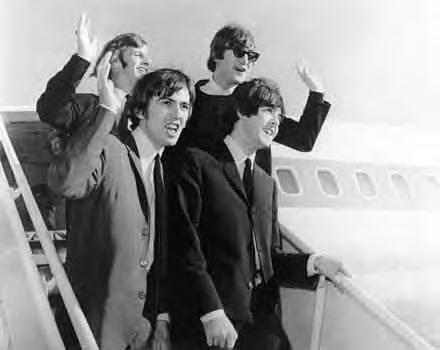 John [points to George]: Not me. Him. Why don't you smile, George? George: I'll hurt my lips. What's your reaction to a Seattle psychiatrist's opinion that you are a menace? George: Psychiatrists are a menace.